Frederick Harwood Rendell, known as Fred, was born either in Yeovil or West Coker on 5 March 1893. He was the son of gardener George Rendell (b1859) and his wife Mary (b1862). George and Mary's children were Fred, Reginald (b1894), W Harry (b1897) and Ivy (b1899). In the 1911 census, the family were recorded at 78 Huish. However, at this time 18-year old Fred was recorded (as Frederick Herbert) as an 'inmate' at the Reformatory School, Kingswood, near Bristol. Sadly, little else is known of Fred or his family. There is also some confusion; the Western Gazette clearly states that Mr & Mrs G Rendell lived at 78 Huish - Mrs Rendell being called Mary in the 1911 census. However, the Commonwealth War Graves Commission recorded Fred's mother as Catherine and the family of West Coker. I tend to favour the former. Fred enlisted in the Royal Marine Light Infantry (Service Number PO/17293), either before or shortly after the outbreak of war. He is known to have served aboard HMS Invincible. HMS Invincible was the lead ship of her class of three battlecruisers built for the Royal Navy during the first decade of the twentieth century and the first battlecruiser to be built by any country in the world. During the First World War she participated in the Battle of Heligoland Bight in a minor role as she was the oldest and slowest of the British battlecruisers present. The ship engaged the German light cruiser Cöln, but did not hit her before Cöln was sunk by the battlecruiser Lion. During the Battle of the Falkland Islands, Invincible and her sister Inflexible sank the armoured cruisers Scharnhorst and Gneisenau almost without loss to themselves, despite numerous hits by the German ships. HMS Invincible was the flagship of the 3rd Battlecruiser Squadron during the Battle of Jutland in 1916. The squadron had been detached from Admiral Beatty's Battle Cruiser Fleet a few days before the battle for gunnery practice with the Grand Fleet and acted as its heavy scouting force during the battle. During the Battle of Jutland, at 6:30am on 31 May 1916, Invincible abruptly appeared as a clear target before Lützow and Derfflinger. The two German ships then fired three salvoes each at Invincible and sank her in 90 seconds. At least one 305 mm (12-inch) shell from the third salvo struck her midships 'Q' turret. The shell penetrated the front of 'Q' turret, blew off the roof and detonated the midships magazines, which blew the ship in half. Of her complement, 1026 officers and men were killed, including Private Fred Rendell and Rear-Admiral Hood. There were only six survivors picked up by Badger. On 9 June 1916 the Western Gazette reported "Townspeople generally will regret to learn that a number of Yeovilians were on the various ships sunk on Wednesday last in the battle off the coast of Jutland amongst them……….Private Fred Rendell, second son of Mr and Mrs G Rendell, 78 Huish, was one of the heroes on the Invincible when she was sunk. He had served in the Navy about two years and was home a month ago. Accompanying the final message of his death, received on Wednesday was a Royal message of sympathy signed by the First Lord of the Admiralty. He was only 23 years of age." Fred Rendell's body was not recovered for burial. 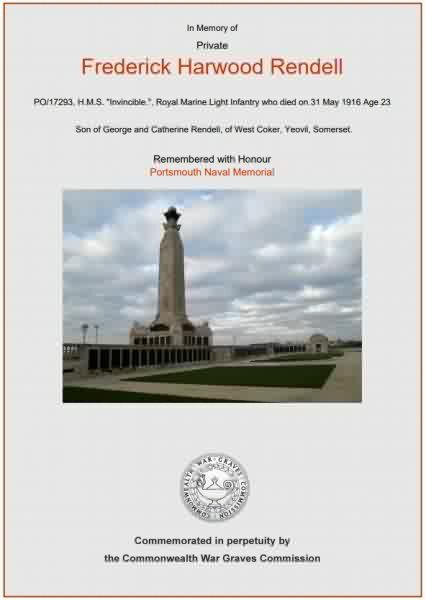 He is remembered on the Portsmouth Naval Memorial, Panel 22,and his name is on the Yeovil War Memorial in the Borough. The Commonwealth War Graves Commission certificate in memory of Fred Rendell.